With so much choice of accommodation in Port Douglas it pays to be discerning! 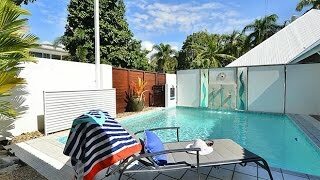 Serenity Accommodation Port Douglas is an immaculate holiday home situated on much sought after Garrick Street, just 20 metres from the world renowned four mile beach and located just a few minutes walk from all the popular cafes, bars and boutique shops of the Port Douglas strip. This Villa boasts a temperature controlled private pool, private tropical outdoor dining area and direct access to the beach. This three bed three bath house is amongst Port Douglas finest. If you like the photos you see here, wait until you see their website! Click on the weblink above for more photos, a virtual tour, blogs and get to know them by clicking on their 'Our Story' tab on their website. Each bedroom has ceiling fan, air-conditioning and its own bathroom. The entire villa must be let, cannot let individual rooms.